Toad, there's a whole chunk of your 'advertise the site' post from last week in this week's Campaign (our only real trade mag). i agree that agencies can no longer assume that their moderately amusing little stories will cut it in the age of the internet. and we should be way more open. but i have to say i (along with everyone on scamp's blog) was disappointed by this effort. 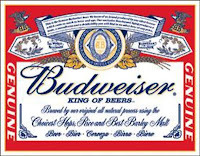 it just doesn't put me in the mood for a bud.and believe me it doesn't take much to put me in the mood for a bud. ;-) it just hits the wrong note. i'm guessing part of the problem was that it was tested. but still. Seriously though, I wasn't sure how Bud was viewed in the UK. Here, it's just a popular cheap beer, but beer brands can take on a whole new life elsewhere-- just ask all the guys from western Pennsylvania who watched in amazement as Rolling Rock, the local cheap brew, somehow became a yuppie phenomenon. national stereotype? guilty as charged. not sure how it's "negative" though. it's actually very interesting, to me anyway, how bud is perceived abroad. in ireland and the uk in the 90s, the bud longneck bottle commanded a premium as a more sophisticated import and cost more than say the locally brewed Carlsberg or Heineken. which proves my theory of beer: IT'S ALL IN YOUR HEAD!